One piece of bacon wrapped around each breast is enough. 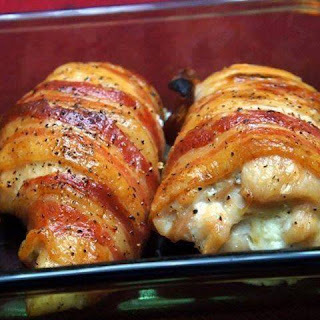 But 2 pieces of bacon for each breast fully wraps the chicken and is outstanding as well. this recipe is very adaptable to being basted with your favorite grilling sauce, marinade, chili sauce, or sweet and sour sauce during baking. 1 lb. of chicken usually equals one large chicken breast cut in half. Cut each half in half again and you will have four 4 ounce pieces.